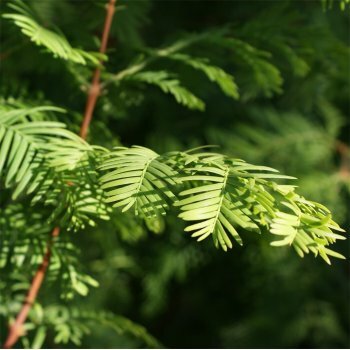 A lovely, deciduous conifer, Metasequoia glyptostroboides has soft, feathery foliage that is lush green throughout the spring and summer, before turning yellow and bronze in the autumn. Known as a Dawn Redwood or Water Larch tree, it has rough, fibrous and dark mahogany brown bark. Metasequoia glyptostroboides will grow to 12 x 5 metres in 20 years and is most deserving of a space in gardens with enough space, as it is critically endangered in the wild. Plant this tree in a sheltered position with sun or partial shade in moist, well-drained soil. It will tolerate waterlogged soils and boggy positions if planted out of exposure. Nigel's Nursery Notes: The third photo was a 150-200cm tree like our 12L stock that I planted in 2008 and is now around 8 metres tall! Our pot grown Metasequoia glyptostroboides trees can be planted at any time of the year. Firstly, remove weeds and grass within a metre of your desired planting hole then dig a hole as deep as your root mass and approximately 2x as wide. We recommend digging a square hole as this encourages the roots to grow straight as opposed to around inside the hole. To help Dawn Redwood trees establish more effectively, we advise applying root grow by sprinkle in the hole. We advise planting Dawn Redwood trees with a stake and tie kit. To see how to use a tree stake and tie, watch our informational how to videos. If you’re planting Dawn Redwood in spring, summer or dry weather, water well and regularly for the first few months. Keep an eye on your young tree and increase watering if there are extended periods of hot or dry weather. If you’re planting in autumn, you may only need to water your tree a little. We also stock a range of irrigation kits, suitable for a variety of planting schemes. Once planted, keep the area free of competing weeds and grass for the first few growing seasons. Installing mulch matting and bark chips will aid in this. Do not simply mow the grass around the area as this will only encourage it to grow more vigorously. If your area is prone to rabbits, we advise using a rabbit guard. Metasequoia glyptostroboides does not require a lot of pruning. Simply remove any dead, diseased or awkwardly placed branches as and when you see them.